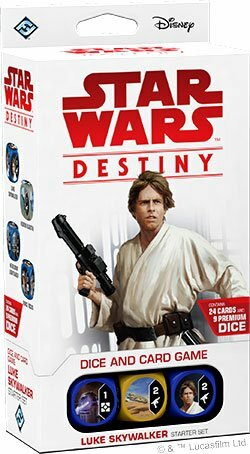 Star Wars Destiny - Legacies Previews - Budget Legendaries Abound — GamingWithSwag.com - Dads By Day, Gamers By Night. Today Fantasy Flight showed off some more cards from the Legacies starter sets including a new Slave 1 and Millennium Falcon. Both had previously been Legendary cards, and those paired with Luke, Han, and Obi-Wan give us budget versions of 5 Legendary cards in this set. It seems logical to have some of the most popular characters and vehicles available for casual players, but lets compare them and see if the new budget versions are good enough to devalue the use of the old Legendaries we know and love. The Millennium Falcon is back and more affordable in the starter kit, and immediately becomes one of the best non-legendary vehicles making that archetype more approachable for budget and casual players. The ability speeds up a vehicle deck which is one of their weaknesses, and means it can be added more easily to a non-vehicle deck without slowing that team down. The downsides would be adding a blank die face, and generally weaker die faces across the board. The best die face dropping from 4 aimed damage to 4 indirect damage for a resource. I actually prefer the ability as it is always useful while the old Falcon could roll a special and you may not have a yellow event in hand, or it might be cheap to play anyway. Since the name is the same and it is unique you can't run both at the same time, which is the same with Slave 1 so you will have to pick a favorite. Although if you are new to the game you can skip hunting down the Awakenings version and still make the Kessel Run, but I think I will stay with the classic version in most of my decks. Slave 1 is also cheaper and the majority of the damage die sides are indirect damage, however the power action adds mitigation options which could be useful in some builds. The previous version had potential to be devastating with the special especially later in the game when your opponent may have ton of dice in play, and the new version doesn't have the same ceiling of damage. However, I again see great value in the new version especially with the Power action giving you a free re-roll with the chance to remove an enemy die. Re-rolling a blank to something useful on its own could save a round. I honestly might prefer the new one, or it is close enough that I see the old one dropping in value a bit. Luke isn't exactly a replacement, he is thematically from A New Hope and has ranged damage primarily and is cheaper and weaker than the full Jedi version from Awakenings. The new version could make for some interesting pairings especially adding his ranged damage synergy with red and yellow heroes. The recent updates to the game have salvaged the old Luke a bit as shields and some of the newer cards keep him alive and allow him to become a powerhouse, and I think they both see some play similar to the 2 markedly different versions of Darth Vader. A cheap Han with a slightly more consistent ability should find a place, although I love the Awakenings Han Solo and while I like the discard side, I don't love him getting a modified resource side. The old Legendary was a solid utility player that dealt decent damage, shielded himself, could blow up a whole round of resources, and made money when you needed it. This new Han isn't really great at anything, and I think better support characters exist. I mean I would prefer 2 Ezra dice to a new Han, but there may be some other cards coming that improve him similar to the named weapons from the 2 player starter kit like Captain Phasma's Blaster that had a bonus for its true owner. Obi-Wan is younger and more interested in dealing some damage, so immediately I think he becomes a more popular hero. Additional bonus, he is actually cheaper and has an extra health. The classic Obi-Wan has seen his value drop already and now it will continue. 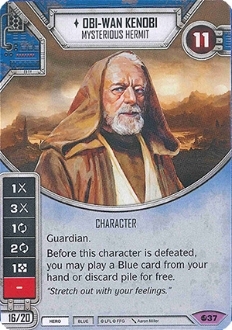 Playing Obi-Wan and his Guardian ability and then playing One with the Force was great thematically but is slower than most people will prefer. And you can still drop One with the Force on the new version, assuming you save up for it. The new sets look interesting, and I like some of the new spoiled events like the "Guardian" card Crash Landing which lets you send damage where you want to, and could eliminate an "after" effect like Emperor Palpatine's damage bonus after resolving a die. And Force Focus will be amazing as a control card as it focuses your die and messes up your opponent at the same time. Are you excited about the new set, or is you wallet still recovering from Empire at War?